Home » News » Experiencing the IBA-VIAC CDRC Vienna 2015 and 2017: A Fascinating Déjà-Vu? 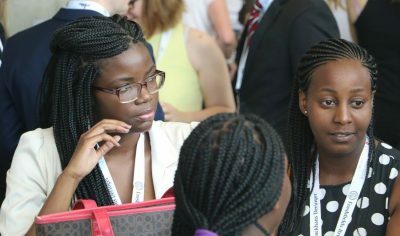 Experiencing the IBA-VIAC CDRC Vienna 2015 and 2017: A Fascinating Déjà-Vu? There have already been so many reviews of the three CDRC editions, which I absolutely enjoyed reading. Here’s another one but what will this one be about? This is a window into the experience of a 2015 participant who was wondering if attending CDRC 2017 was a déjà-vu or an all-new experience. In the first edition of CDRC in 2015, I was a member of the University of Bonn Team. Together we placed second in Negotiation and won the awards for Best Mediator and Best Team. 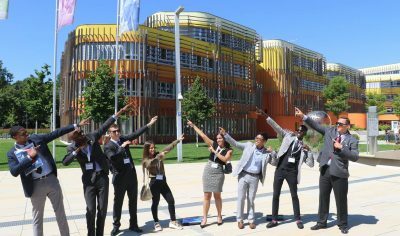 In the 2017 edition, the University of Bonn placed second in Negotiation and won the award for Best Mediator again. However, in 2017 I participated in a different way: I was volunteering in the CDRC Organisation Team; an entirely unfamiliar role for me. Still, it felt familiar. I wasn’t stressed about the competition rounds, but I was. I wasn’t up late preparing for the next competition days, but I was. I wasn’t nervous about forgetting anything important, but I was. Just that in 2017, it was for different reasons. Both participating and organizing require determined preparation, a determined team, strong nerves and strong coffee. Both teach valuable lessons and I wouldn’t want to miss a single one of them. So let’s recap based on two points: the knowledge and learning experience, and the people at CDRC. Of course, one of the major aspects of CDRC is the learning aspect. Students sometimes have their first practical mediation experience, get valuable feedback, and improve over the course of the competition. I think I don’t only speak for myself when I say that no matter how intense the preparation, the competition itself is the time when you suddenly find yourself on the fast track to learning progress. It is the combination of dealing with unfamiliar people, various cultures, and different negotiation styles as well as the competitiveness that makes the experience unique and something you cannot reproduce in the preparations. The onsite learning already starts prior to the first round; it starts in the workshops with the experts. You get to choose between various topics and experts that share their knowledge with you and give you the chance to try your new skills in short role plays. It’s not only an entertaining way to warm up for the competition but also the rare opportunity to have a vast range of experts that gather in one place and offer their classes for free. In my year of participation, we mainly used this day to finalize our internal team preparation. However, I can highly recommend attending as many workshops as possible. You have months to prepare with your team, but you have one day only to benefit from this offer. So, attend the workshops you are interested in and make the most out of this opportunity! Whenever the 2017 schedules left me some time or it was even part of the schedule, I was watching the sessions which were all new to me. In 2015, I participated all the way from the first preliminary round to the final round. I know, this is a luxury problem and I appreciate that I had the chance to practice my skills as many times as possible. Still, I was curious to watch a session from an impartial point of view for the first time and I recommend everyone to go through the competition with this curiosity because I learned a lot from each of the teams I was lucky to observe. Particularly, I’ve often heard that people don’t listen to understand but they listen to respond. While I was not sitting at the mediation table I found a whole new meaning in this for me. As I didn’t have to think about what to say and ask next or to make any strategical considerations, I was able to listen even more carefully than I thought I had already learned to do. Observing situations that reminded me of the sessions I was a part of in 2015, I suddenly found the feedback we received back then to make a lot more sense to me. I recognized some tactics we used – or tried to use – but this time I watched them from a different point of view and realized how they can come across and might lead to misunderstandings. Also, listening to the judges’ feedback differs if you’re not actively involved in the session. Even if the feedback was not directed towards me in 2017, it was revealing. As I was able to notice more details, it often happened that the judges mentioned things that had also caught my attention during the session. Hearing the experts’ comments on these details made my impartial role as a spectator a highly valuable one. This leads me to the next point: the people. As a part of the Organising Team I necessarily came into contact with probably everyone; some more, some less, but I enjoyed meeting every single person because the learning experience does not stop after one session is closed. 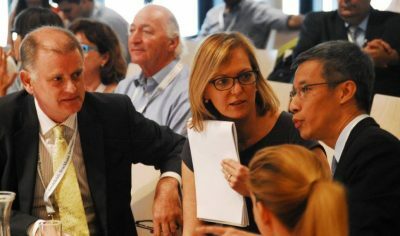 It’s the conversations between the sessions, at lunch break, while having a coffee, or during the evening events that also give an interesting insight. You not only discuss what just happened in the sessions but also how the teams came to participate. The way people learn about mediation, if they have a professional teaching programme at their university or if they gained all their knowledge of alternative dispute resolution in self-study and group work is sometimes surprising and always interesting to hear. Regardless of all the differences in financial or professional support from the universities, the teams end up having productive sessions. During preparation we have read the same books, learned about the same theories and tactics, and even if we all come from different linguistic and cultural backgrounds, at the mediation table we speak the same language. Moreover, CDRC would not be CDRC without the experts! I already knew some of them from 2015 and was looking forward to seeing them again. Some of the experts I met for the first time in 2017 and I am no less thankful for this opportunity. I am so impressed by their knowledge and their works that I am often surprised how approachable every single one of them is. They’re not only willing to answer all your questions, give advice, and elaborate on their feedback; they share their experience at all hours during the competition just as much as they share some wine with you. Thanks to CDRC 2015 and the great connections I’ve made, I was able to complete an internship in an outstanding ADR specialized firm in São Paulo, Brazil, in 2016. Needless to say that the learning experience was tremendous! On top of this, I had the chance to spend more time with my friends from CDRC in a beautiful country. The CDRC friendships already last for years and led to unforgettable memories and travel all over the world. When you participate in any capacity in this competition, you’ll often hear people calling it the “ADR Family” or “CDRC Family” and I can only agree. Many people that already attended in 2015 come back every year and if you’ve been to any of the CDRC editions you’ve probably also thought about coming back at least for a second. With all the similarities and distinctions, I can’t label any of my CDRC participations as the better experience. I don’t want to miss a single one because they’ve both been valuable in their own way. I hope CDRC continues growing so that as many people as possible can experience priceless CDRC moments full of learning and laughter. At the end of the day, I can’t wait for another Family Reunion at CDRC 2018 when we will all come together again and meet with old and new members. Melanie Koch is a law student at the University of Bonn, Germany. In addition to her studies, she works at a leading international law firm where she focuses on corporate law, mergers & acquisitions, and energy law. Melanie represented the University of Bonn in the first CDRC Competition in 2015. The Team won the Awards for “Best Mediator” and “Best Team“. She also participated in the 56th Phillip C. Jessup International Law Moot Court 2015 and the 11th ICC Mediation Competition in 2016. Melanie has worked with Faleck & Associados, an ADR specialized firm in São Paulo, Brazil and was an international law scholar at Xiamen University, China. 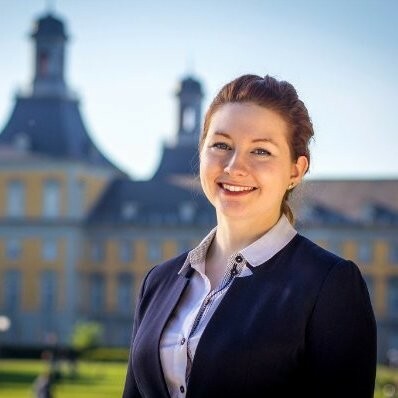 Melanie is a member and former President of the student initiative “Bonn Negotiators” which regularly hosts lectures on negotiation and mediation.